What are those, tomatillos? Hopefully they'll be deep indigo and sweet soon. Just a strawberry or two to tease us. Of all the bounty that grows in Oregon, our berries are best. We even have certain varietals–think Marionberries–exclusively developed and grown here. So naturally I’d want to try to cultivate some of these sweet gems in my home garden. Last summer, let’s just say I didn’t get off to the best start. I bought a hanging strawberry basket that unfortunately dried up, as it got ignored while we were traveling all of July and part of August. 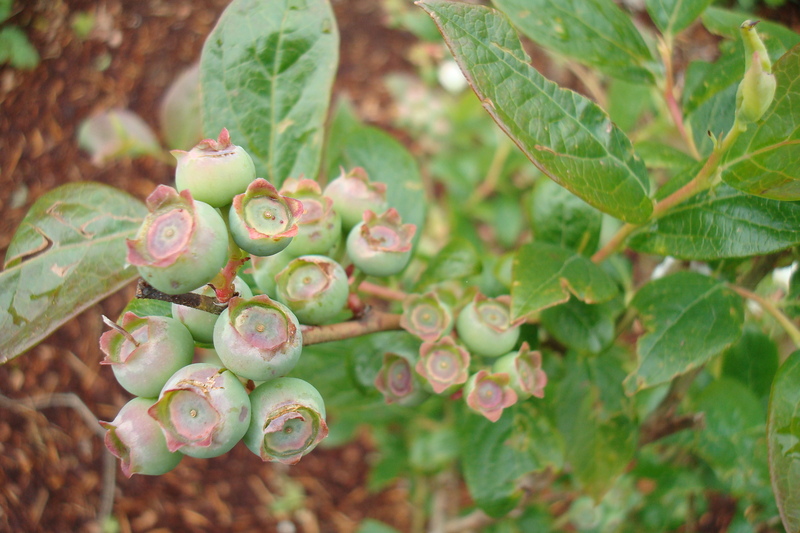 I also had two discounted blueberry plants shrivel up when I waited to long to plant them. But a $2 gooseberry from the Habitat for Humanity Restore miraculously survived. 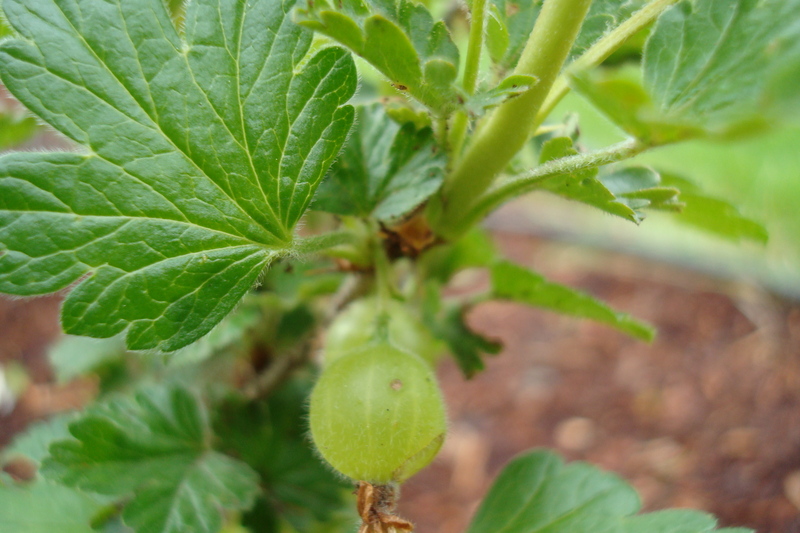 It’s only promising about two gooseberries this spring, but that’s a start. Not that I’ve ever cooked with gooseberries. But I hear they make nice pie and jam. A wee gooseberry or two. 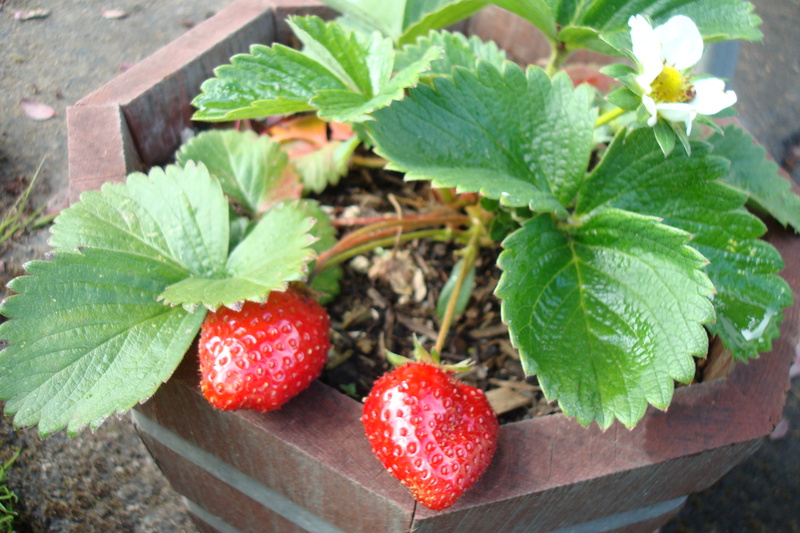 To keep slugs at bay, I’ve got about a half dozen strawberry plants in small pots. The ants still seem to be crawling all over the few ripe owns. Our erratic weather just hasn’t been warm enough to redden them up. Heck, it even hailed last week, and farms suffered the damages. I can see why local growers such as Denison Farms do strawberries in hoop houses. Now I appreciate their labor. And they grow them without pesticides or chemical fertilizers, unlike my once-beloved Baugher’s pick-your-own berry farm in Maryland. When I went out to the Taneytown area farm to report my story for The Baltimore Sun, I remember some whitish and blue chemical residue around their strawberries made those bright red rubies slightly less appetizing. 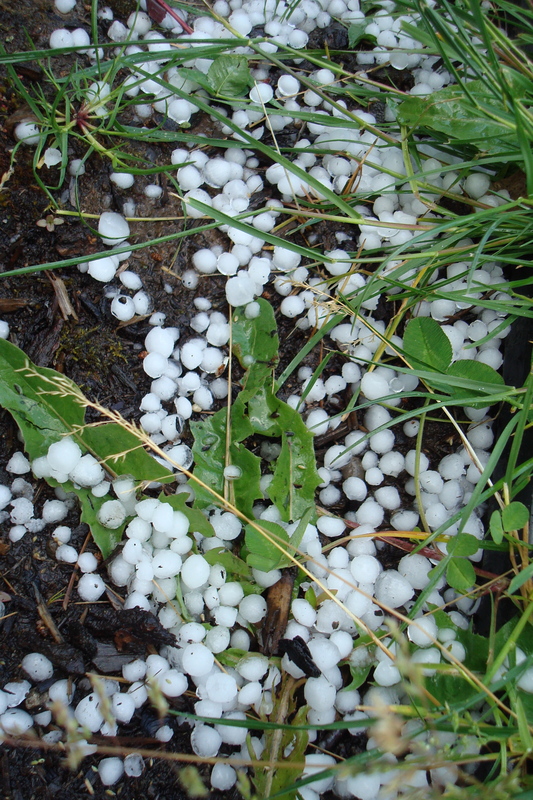 Evidence of Thursday's brief hailstorm. At least one of two blueberry plants looks like it will yield a bit of a crop. I dug two scrawny five-year old bushes (can’t remember if they were Bluecrops, Chandlers or Dukes) up from a patch Hazelnut Hill orchard wanted to clear out. Not bad for $5 a piece. But I probably didn’t amend our clay soil enough before planting those shallow rooted things at home. I did try to mix in some acidic mulch to encourage the ground to drain a bit better. Then we had a truck blow some mulch into the area. Hope it wasn’t all for naught. It did pain me to see the honeybees mostly ignore my two bushes in favor of the neighbors’ heartier berries in early May. I planted ours near their border, to encourage cross-pollination. Survival of the fittest, indeed. We have our blueberry bushes in containers. It looks like there will be lots of berries this year, if the birds don’t get them as they have for the past 2 years, despite netting. We’ll see…we’re being hopeful.